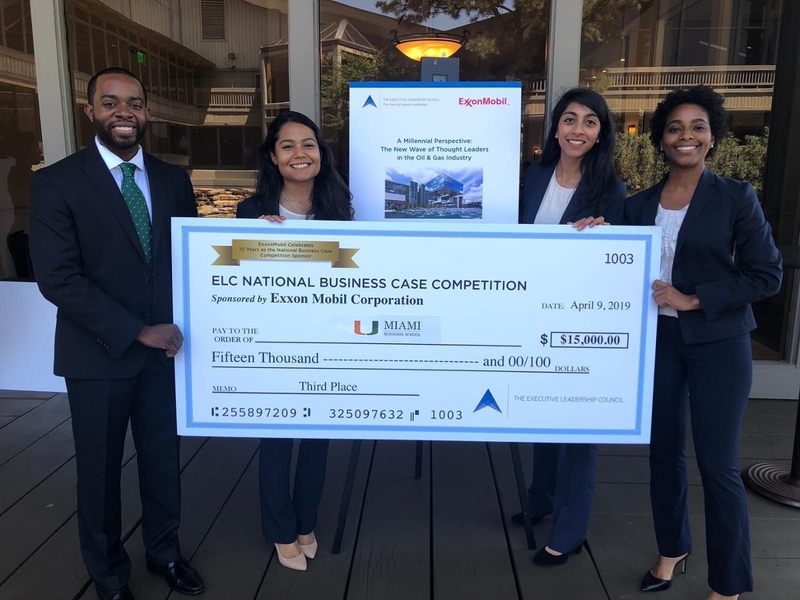 Miami Business School's David Rowe, Dipeeka Bastola, Samira Patel and Jacqueline Holmes at the Executive Leadership Council’s (ELC) 2019 National Business Case Competition. A team of four MBA candidates from Miami Business School won third place and a $15,000 prize at the Executive Leadership Council's 2019 Business Case Competition in Spring, Texas. The MBS team was led by captain Jacqueline Holmes (GBSA Vice President and Peer Advisors Co-Chair) and included fellow second year full-time MBA students Dipeeka Bastola, Samira Patel and David Rowe. Rowe was also recognized as “Best Presenter" by the judges. The team faced off against two other finalist teams representing Duke's Fuqua School of Business and The Wharton School in a competition presented by the preeminent membership organization for the development of global black leaders. The annual competition invites students from the nation’s top business schools to form teams, led by Black team leaders, to analyze a timely business issue that demonstrates the students’ critical thinking, analytical and communications skills.